I just got back from an AMAZING four day weekend in Cuba — primarily in Havana. Let me tell you, it pays to do your research. We explored Havana and surrounding areas. Havana is amazing, but you want to know what you’re walking into. If I can say one thing: do your research. In our day an age, we are so “internet reliant” — we just don’t plan like we used to in times past. This don’t fly in Cuba. With limited internet, you want to know your game plan before you go. Even if you vary it, you’ll want a strong starting point. Weekend itinerary for what to in Cuba – 4 days in Havana Cuba with this Orlando native. Since I’m insane about research and planning, enjoy the fruit of my neurosis! Or, if you’d like to read Yelp and Trip Advisor for 100 hours, go for it. 🙂 I spent a year reading about Cuba (with increasing compulsion) before we went. And yes, we’re going to go again! Arrive in Havana. Get picked up from the airport by your Air B&B host. (They pretty much all offer this now.) It’s about $25-$35, depending on your host. It’s worth it, since that initial moment when you walk out from the terminal you just want to see a sign with your name on it. After you leave the airport, you need to change your money. You’ll be immediately impressed with the outfits on the airport staff too. **TIP: Bring British Pounds or Euro, or any currency other than American dollars. You’ll get more from your exchange. 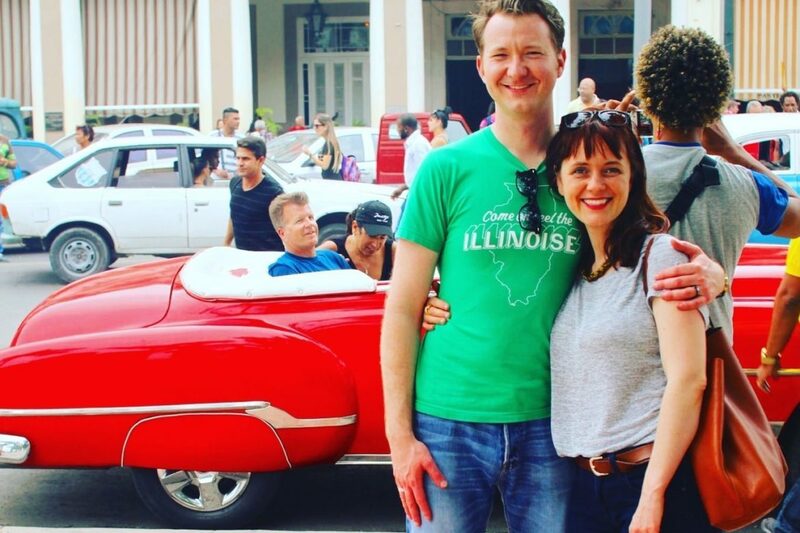 You will notice that pretty much all the cars in Cuba really smell like exhaust and are definitely “vintage”—but isn’t hat part of the charm? Your Air B&B host will be a great resource for you, so make sure to shower them with questions. It’s nice to get an airport pickup when you first arrive for your weekend in Cuba. I really loved how each room had a private second floor balcony. Great for sitting there in the morning with coffee or just writing in the evenings. Our Air B and B in Havana had beautiful old world charm. Our Air B and B in Miramar near Havana — about a 1 hour walk or a 10 minute cab drive. Quiet and with beautiful gardens. We stayed in Mirama, about 10 minutes outside of Central Havana Cuba. **Tip: When you get to your Air B&B, immediately ask them to help you call the restaurants you want to eat at. You’ll need reservations to get in anywhere good. Read about El Chanchullero de Tapas on Yelp here. Sure, it feels a little like a roof top spot in Brooklyn. But is that really bad? We loved it. Bar of Tapas, is located in Lieutenant King 457A low, and / Bernaza and the Christ, (Place of the Christ), Habana Vieja, Havana, Cuba. A few minutes from places of reference such as: The Capitol, Hotel Telegrafo, Hotel Parque Central, Hotel Inglaterra, among many others. Delicious tapas which really are more of a lunch. Drinks here are also INCREDIBLE! Amazing mojitos and tapas on the rooftop of El Chanchullero de Tapas — if you don’t have a reservation, ask to go upstairs. Want to eat INCREDIBLE food in Cuba? Head to this hipster feeling restaurant. Amazing ambiance in this Havana Cuba restaurant. Delicious food at this place in Havana – definitely on your Cuba itinerary! El chanchullero menu, wonderful prices & food! After lunch wraps, you might want to head 1 block down the street to El Dandy for a post-lunch drink or just to sit and people watch. Read Yelp review on El Dandy here. El Dandy is a delightful old world Hemingway style bar with no tourists, just genuine vibes. Enjoy some people watching there after lunch. What to do in Cuba? Visit El Dandy, a great little place to chill. El Dandy in Havana Vieja – great spot for your weekend in Cuba itinerary. People watching here is perfect! What to do in Cuba? People watch in Old Havana. A great way to really get a feel for old Havana is to do a walking tour. Get in touch with me for a recommendation on a great 100% fluent English speaking tour guide. We used a 22-year-old named Gabriel who was super fun, fair, and very knowledgable. Walking tour of Old Havana. Watching the Cuban people – a favorite pastime for Americans in Cuba. A walking tour is a great way to see old Havana – a must for your weekend in Cuba itinerary! Walking tour sights of old Havana – weekend in Cuba. See the amazing architecture and history of old Havana in a walking tour – great idea during your weekend in Cuba! What to do in Cuba? Take a walking tour! See Plaza de Arms. Havana Cuba is a photographer dreamland. What to do in Cuba? Take pictures! Enjoy walking around old Havana Cuba. What to do in Havana Cuba? Enjoy the architecture! What to do in Cuba? Enjoy art in Havana’s hidden corners on a walking tour. Weekend in Cuba – try eating at this delicious restaurant (as long as you make reservations!) Dona Eutimia is delicious. Read Yelp review Dona Eutimia here. Wonderful, delicious place to eat for around $5. Ready for some Cuban jazz? Head to the classic choice. It’s going to be a taxi ride from old Havana, but so worth it. If you like jazz this is your place. Check it out. It’s amazing live jazz Cuban music. Every day a different band. Saturdays that they host a radio show in the afternoon and have a happy hour. Read Trip Advisor review La Zorra y el Cuervo. Want to explore another jazz scene? Try out this one! For a $5 cover, you get 2 incredible hours of salsa/funk/fusion with Interactivo, one of the most exciting and funky bands in Cuba. Considering the quality of musicianship and the level of hype in the audience, $5 is really worth it. Arrive around midnight and get ready to stay out late! Read Trip Advisor review and info. Explore the amazing street art and creativity here. Read Trip Advisor review Callejon de Hammel. Explore this arty part of Havana, perfect for a Saturday morning. Read Trip Advisor review on El Del Frente. Visit their Facebook link here. We really enjoyed visiting the grand hotels in the middle of old Havana. We went to the roof tops and enjoyed a beautiful late afternoon hangout / sunset chat with drinks. Pop over to the Hotel Inglaterra, which is the oldest hotel in Havana and a fun spot for pictures if you enjoy retro signage! Go upstairs and see view from the roof. Hotel Inglaterra, the oldest hotel in Havana and a fun spot for pictures. Grab a drink on the rooftop of Hotel Inglaterra, the oldest hotel in Havana. Sunset view from Havana Cuba downtown hotel roof. What to do in Cuba? Enjoy sunsets and write a novel like Hemingway. La Fábrica de Arte Cubano — this feels like a mix of CBGB, Art Basel Miami, a community center, a coffee shop, a bar (or two or three) and a bomb shelter. Arrive for folk dancing, and you may end up lost, in a good way, listening to reggaeton or staring at sculpture, huge canvases of colorful paintings, or black-and-white photography. “It’s an urban experiment,” said Inti Herrera, a member of the artists’ collective that runs La Fábrica with permission from the government, which owns the building. There’s a 2cuc cover and you’re given a card to resemble their ration book that you’ll have stamped for every purchase. No money is exchanged at the beverage bar or infusion-snack bar, you pay on your way out. However, don’t lose that booklet or you’ll pay a flat rate of 30cuc. Visit their Trip Advisor review page here. What to do in Havana Cuba? Do NOT miss Fabrica Des Artes! Fabrica Des Artes is a mecca of amazing modern art in central Havana. It is a MUST see on your Havana Cuba itinerary! In the middle of Fabrica Des Artes you’ll find the Cuban version of Anthropologie — except all the dresses are made by crazy talented old seamstresses from Havana. Amazing food in a shipping container attached to Fabrica des Arts – Havana Cuba things to do! Enjoy modern art in Havana Cuba – put this on your 4 day itinerary for Cuba! Fabrica des Arts – artsy fun in Havana Cuba – put this on your itinerary! Check out Havana’s modern art scene at Fabrica des arts! This will depend on you. Santa Maria beach is about 1 hour (they say 30 minutes, but it’s an hour with traffic.) This will cost you $20 each way. If you prefer pool, go to the nicest one. A cab to the beach at Santa Maria beach will cost you $20 each way from Havana Cuba. Beach about 30 minutes to 1 hour from Havana. Nice beach day trip. If pool is more your style, visit one of the downtown pools for the day in Havana Cuba. Either beach or a nice hotel rooftop is a great way to spend a day in Havana Cuba – make sure you have a day of lounging by water in your itinerary! Old Havana, Havana Vieja, has a certain charm at night. Walk around and absorb this. What to do in Cuba? Enjoy the culture or Old Havana at night. It feels like a Vincent van Gogh painting with the lights and the old buildings. Havana Cuba at night – Americans in Cuba. Want to be a tourist? Grab a daiquiri at Hemingway’s old joint, or at least take a picture. (Supposedly famous for the daquiri and still unmatched.) Visit their website here. Head to El Floridita —the old Hemingway hangout. Pack up your things, say enjoy a nice coffee and breakfast at your Air B & B and head out for your flight. We loved the quiet garden outside of our Air B and B. Great for chilling. We loved our Air B and B hosts in Havana Cuba! But I like to “wing it” on vacation. Isn’t this itinerary kinda too planned? Sure, go ahead and “wing it” in Cuba. But just a head’s up, when we went to restaurants with no reviews, they weren’t great. We got paella in one place and it was practically rotten. We had to send it back. Americans know what Americans like (on some level). I love finding out of the way, hole-in-the-wall places too. But sometimes, it’s just nice to have others with similar interests help you discover those spots. I want to visit a fancy pool but not stay in a fancy hotel. How does that work? Ah-hemm… There is a $20 “pool fee”, but we found if you pay cash for your drinks, it’s not really a question we’re asked. Again, call the hotel for the official policy. (And no hotel elevators have swipe cards to get to the roof in Havana.) You can kinda just visit any pool you like in any hotel you like. If you do pay the pool fee, we were told they give it back to you in mojito credit on the roof. How do I change my money when I leave Cuba? Try not to. At the airport, the line to change money was insanely long. (Not worth missing a flight.) And the airport attendants say “just change it in the terminal area.” But when you get in there, the machine is conveniently broken. Yep. Lesson learned. Don’t be one of those New Yorkers (we saw a few) running around trying to hustle some arriving party to change cash because they needed to get rid of $300 in CUC. Change only the money you’ll use. And try to get rid of it with a friend or fellow traveler before you leave. Want to spend more time in Cuba and see other areas? Fantastic idea! You might consider horse back riding in Trinidad, about 4 hours away from Havana Cuba. There are beautiful coffee plantations and tours there. Beach in Trinidad Cuba. A four hour trip from Havana. Awesome authentic tour of Trinidad Cuba. During the tour, they bring out coffees for you to sample and play live music. A little touristy? Yea, but still a lot of fun! Ride horses in Trinidad Cuba. Thank you!! Really appreciate your post! How were you able to make the reservation at the air b/b having an American credit card? We paid through Air B&B with our American credit card. Yes.